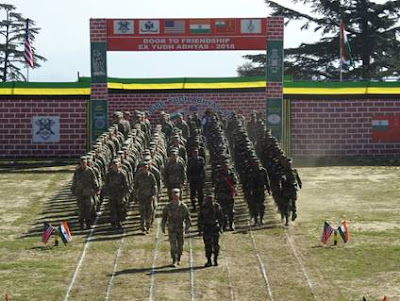 Exercise Yudh Abhyas 2018 a joint military exercise of Indian and US armies, commenced at Chaubattia, Uttarakhand with a short yet impressive opening ceremony that saw the unfurling of the national flags of both countries to the strains of "Jana Gana Mana” and “The Star Spangled Banner". Indian and US soldiers stood side by side, and gave a ceremonial salute to the two senior most officers of the US and Indian side reviewing the ceremony. The US contingent was represented by 1st Infantry Battalion, 23 Infantry Regiment, US Army while Indian side is represented by an Infantry Battalion. General Officer Commanding, 6 Mountain Division welcomed the US soldiers and in his inaugural remarks highlighted the common shared beliefs of democracy, freedom, equality and justice that are precious to both nations. Battalion strength army personnel from USA and an equal number of Indian soldiers are taking part in the two week long event that will see them hone their tactical and technical skills in countering insurgency and terrorism in a UN peace keeping scenario involving a combined deployment at a brigade level. State of the art equipment for surveillance and tracking, specialist weapons for close quarter battle with terrorists, explosive and improvised explosive device detectors, as well as the latest communication equipment are being fielded by both sides. Both sides will jointly train, plan and execute a series of well developed tactical drills for neutralisation of likely threats that may be encountered in UN peace keeping operations during division level command post exercise. The experts from both sides will also hold discussions to share each others’ experience in varied topics for mutual benefit. The Inaugural Edition of the BIMSTEC Nations Military Field Training Exercise i.e. MILEX - 2018 culminated on 16 September 18 after a Validation Exercise and an impressive Closing Ceremony held at Foreign Training Node, Aundh Military Station, Pune. Dr Subash Bhambre, Hon’ble Raksha Rajya Mantri was the Chief Guest for the Ceremony. 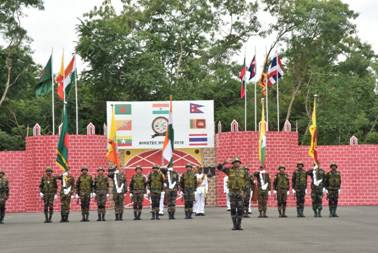 The other dignitaries included Mr Shahidul Islam, General Secretary of BIMSTEC forum, Service Chiefs of BIMSTEC nations, senior Military officers of the Indian Army and representatives of the BIMSTEC Nations who witnessed a Joint Validation Exercise conducted at the training area of Aundh Military Station. The tactical drills showcased during the Validation Exercise included Hostage Rescue by insertion of troops from helicopters, Room Intervention as well as House Clearing Drill as part of Cordon and Search Operations, Raid on a Terrorist Hideout and neutralization of Improvised Explosive Devices(IED). The entire exercise was monitored and controlled through the Joint Command Post established with representatives of the participating contingents. The Exercise demonstrated the commitment and capabilities of the participating BIMSTEC National armies in working closely with each other to eradicate the menace of terrorism existing in different forms. The Validation Exercise was followed by an equipment display organised under the aegis of the Federation of Indian Chambers of Commerce & Industry (FICCI) at Aundh Military Station. Dr Subash Bhambre alongwith the Service Chiefs and other senior army officers witnessed more than 250 indigenously developed defence related equipment. 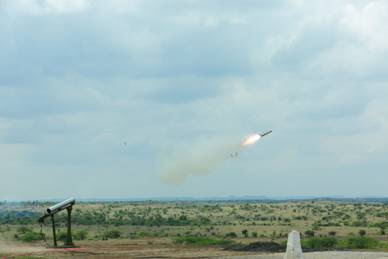 Almost 20 different agencies dealing with defence equipment participated in the display including Ordnance Factories, Defence and Research Development Organisation (DRDO), leading private sector companies, startups etc to showcase some of the latest weapon systems and vehicles produced indigenously. Hon’ble Raksha Rajya Mantri alongwith General Bipin Rawat and General Secretary of BIMSTEC also interacted with the media before the Closing Ceremony. During the Closing Ceremony, Dr Subhash Bhambre reviewed an impressive parade of the participating nations at the drill square of Aundh Military Station in the presence of dignitaries from the BIMSTEC Nations. The parade was commanded by Captain Gaurav Sharma, who is a member of the participating Indian Contingent. The Raksha Rajya Mantri addressed the contingents and dignitaries and congratulated the participating nations for an Impressive parade. He also complimented the troops for the professionalism shown by them during the Exercise. He said that “The MILEX-18 Exercise has provided us all an opportunity to discuss the issue of Countering Terrorism from the military point of view with an endeavour to create synergy, better understanding and evolving of an institutionalized mechanism for regional cooperation in the field of Counter Terrorist Operations. This Exercise and Army Chief’s Conclave held yesterday will further augment the relations between all BIMSTEC nations”. The exercise has been a grand success and has taught valuable lessons to the troops of the Bay of Bengal region in countering terrorism. The camaraderie and friendship developed between the contingents during the course of the exercise will assist in enhancing interoperability between the armies which may be called upon to collectively fight this growing menace of terrorism in the region. 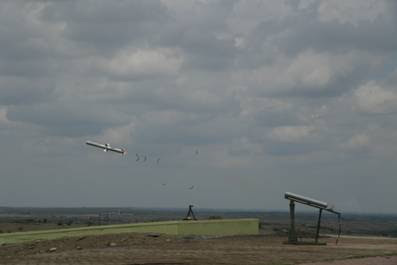 Raksha Mantri Smt Nirmala Sitharaman congratulated the team DRDO, Indian Army and associated Industries for the twin success of MPATGM weapon system.